Castlevania: Aria of Sorrow, released in 2003 for the GameBoy Advance is one of the few games of the series which play in the future, and also don’t feature Dracula as the main antagonist. Of course he plays a role in the story of the game but the main antagonist is Graham Jones here who believes he is the reincarnation of Dracula not realizing that Soma Cruz, the protagonist of Aria of Sorrow is actually closer to that than himself. 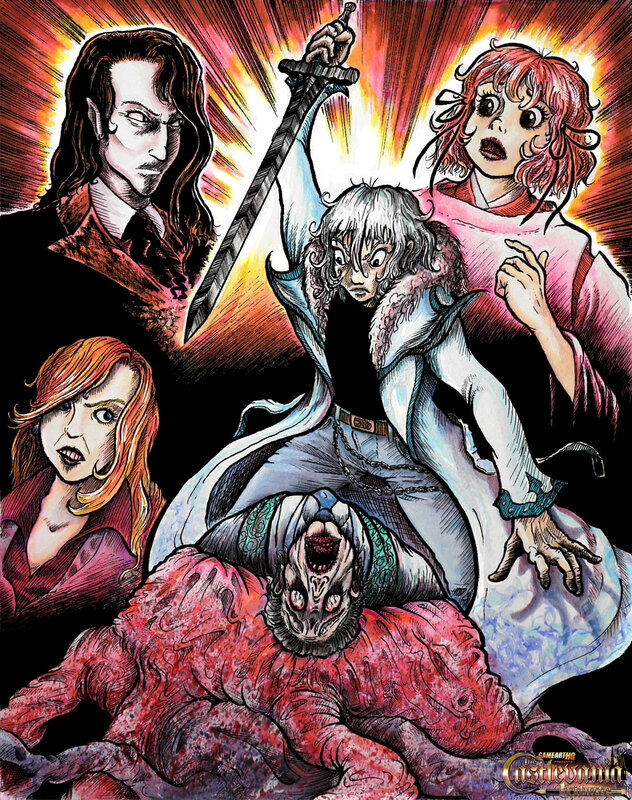 Goemonsama from the USA draw this composition of the final confrontation of Soma and Graham in the game, accompanied by Genya Arikado, Mina Hakuba and Yoko Belnades for our Castlevania Tribute.